Body Harmonics has been part of The Yoga Conference and Show for several years now and we are thrilled to be back. We love this event because of the upbeat energy and chance to meet so many people from the yoga world and beyond. This year we have an expanded presence at the show. In addition to our regular booth and special workshops, we have two large demonstration areas where we are offering stability ball and reformer classes! The classes are designed to give participants the opportunity to try actual classes focusing on the core—especially for people who are newer to Pilates! Here are 8 more reasons to attend the show and stop by our Body Harmonics trade show booth! Attend special workshops taught by Body Harmonics Founder Margot McKinnon. One of the highlights of the conference is workshops taught by Margot. The topics are often condensed versions of our teacher training continuing education workshops. This year’s topics include: Sacroiliac Joint: The Critical, Functional Link (Thursday 6:30-8:30pm); Towards a Healthy Pelvic Floor (Saturday 8am-10am); No More Neck Tension or Strain (Sunday 4:30-6:30pm). Register online at theyogaconference.com/toronto/register.html. Try out equipment and props in a real class setting! We have two demo areas large enough to accommodate full Core Ball and Pilates Core Reformer classes. Classes will be taught by Body Harmonics Founder Margot McKinnon and senior studio and teacher training instructors. Aimed especially at people who are newer to Pilates, the focus is the core, but the classes will be fun and functional. Choose from three classes on Friday, four on Saturday and two on Sunday. Register online at theyogaconference.com/toronto/register.html. Talk to our staff about classes and training offered at the studio. We will have staff at our booth throughout the show, from Friday to Sunday. We are available to talk to you about the various classes and teacher training available at the studio. We will also have sample props and equipment for people to try–under the expert guidance of our teachers and trainers! Take advantage of special discounts on small apparatus and BH branded clothing and manuals. 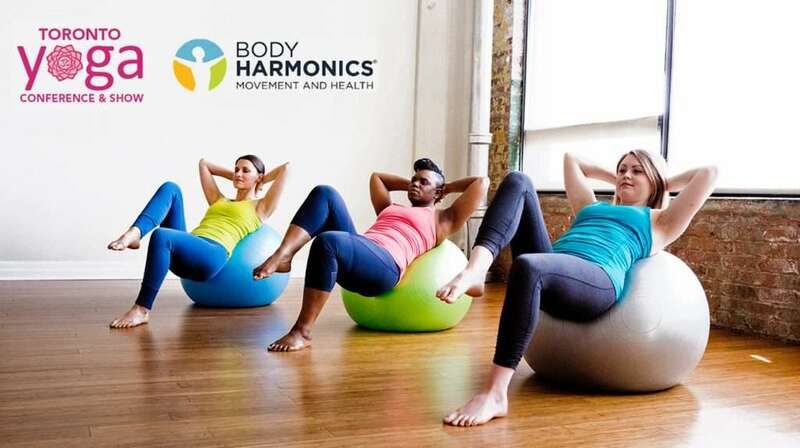 One of the perks of attending the Yoga Show is special discounts on some of the products we sell regularly at the studio—including small apparatus (weighted balls, balance cushions, rings, rotating discs) , teacher training manuals, and our newly released special line of Body Harmonics workout clothing. Come by the booth to see, try and buy! Buy a Reformer and take it home after the show. We’re selling the reformers we’re using for our classes at the Yoga Show!! This is a fantastic opportunity to buy at a favourable price without having to pay shipping and duties. If you’re interested talk to one of the staff at our booth! Shop till you drop! There are tons of exhibitors with all kinds of products on the show floor. We always come home with something new—yoga and Pilates leggings, tops, socks leg warmers, DVDs, books and gismos! Be sure to look around and see what the different booths offer. Eat well! You won’t find hot dogs at this event! This is more the smoothie, salads, vegan, vegetarian and organic fare type of place! But there’s still lots to choose from. And our booth is right next to the food court, so it will be easy to work off whatever you eat! Check out the free classes and other workshops. The Yoga Conference is known for the variety and quality of workshops offered. Check the schedule and register online at theyogaconference.com/toronto/register.html. There are also free ongoing yoga classes in the Yoga show garden—no registration necessary! But they tend to get pretty crowded so it’s a good idea to claim your space early! These classes are a great way to try different kinds of yoga styles to see what they offer. The Yoga Show and Conference is one of the premier movement events in Toronto! Come visit, learn, share—and most of all have fun! We look forward to seeing you!